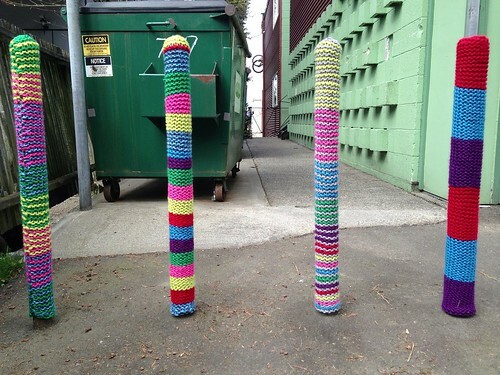 Yarn Bombed Parking Posts, uploaded by adamjk1b. The ‘Mo Wave Arts Festival kicks off on Thursday at True Love Gallery and Pony and continues through the weekend at Pony, Wildrose, and Chop Suey. Cine Independiente features “new wave” film discoveries from Argentina, Friday through Sunday at Northwest Film Forum. The mini-fest opening night features Legendary bartender/cocktail wizard/guest curator Jay Kuehner mixing drinks for your pleasure, including Fernet and cola, an Argentine staple. Wine tasting: explore the best of Down Under with a tasting of five wines from Australia, Vino Verite (208 Boylston Ave E), 4:45 – 8p. Capitol Hill Arts Walk: every second Thursday of the month. This month brings plenty of visual arts installations (up votes on Ghost Gallery, Blindfold, Ltd Gallery, Vermillion, Joe Bar), a dance performance (High 5 Pie), a pay-what-you-can play performance (Theater Schmeater), a street-side mobile video screen (11th Ave), and the return of fun dance party/psychedelics PENETRATION (Vermillion), and more. Glass art exhibit opening party: “BOTANICAL EXOTICA – A Monumental Collection of the Rare and Beautiful” is a 3 part back-to-back series by Jason Gamrath over the course of 6 months. Opening event includes food and drink. The Volunteer Park Conservatory, 5 – 8p. Album release party for The Quiet Ones, with friends Marty Marquis and the Young Evils. Barboza (925 E Pike St), 8p. Author reading: Mania: The Story of the Outraged and Outrageous Lives that Launched a Cultural Revolution. Yes, hippie children, the co-authors will be talking about the Beat Generation: Kerouac Burroughs, Ginsberg, and more. Elliott Bay Book Company, 7p. Band of Sisters is a “poignant, funny and moving documentary by first-time director Mary Fishman showing a forward-thinking portrait of religious women as citizens of the world and covers half a century of activism.” Go sisters! Showing through Thurs April 18th at Northwest Film Forum, 7p and 9p. Cornish Dance Spring Concert at Broadway Performance Hall with performances Friday night, Saturday matinee, and Saturday evening. Palestinian singer, musician, and broadcaster Reem Kelani performs at Town Hall, 8 – 9:30p. OMG It’s Ultimate Frisbee! at Cal Anderson Park both Saturday 4p and Sunday 1:30p. Chance Fashion, Plus Size Edition: this month’s designer networking event features designs by DeLoach, Beauty N Kurves and Twala Intimates. Neighbors, 7 – 10p. My Last Year with the Nuns: a monologue performance by Matt Smith. Richard Hugo House, 7p. The Spring Concert with Thalia Symphony Orchestra includes selections by Sibelius, Tchaikovsky, and Saint Saens. Town Hall, 8 – 10p. The Engendering Project: Features Butoh artist Joan Laage with Okumura (video/photography) and Jackie An (music). Performance explores how gender fluidity and transformation have continued to shape Laage’s work over the past two decades. Vermillion, 7 – 9p. Countdown to Broadway Farmers Market: 1 week! This entry was posted in Community, News, etc. and tagged onthelist by Jeanine Anderson. Bookmark the permalink.